1. This promotion is being run by Multi Slide Industries ABN: 23 008 200 217located at 15-21 Coongie Avenue, Edwardstown, South Australia. 2. Employees of Multi Slide Industries or their family members or anyone else connected in any way with the competition or helping to set up the competition shall not be permitted to enter the competition. 4. Route to entry for the competition and details of how to enter are via email submission to info@multislide.com.au http://www.multislide.com.au/contact-us Entrants must update their Name, Business Name, Job Title, Email address and Phone Number with Multi Slide Industries, to be eligible. 5. Opening date for entry is Friday the 4th of December, 2015. Closing date for entry will be Thursday the 18th of February, 2016 at 5:00pm (ACST). After this date the no further entries to the competition will be permitted. 7. 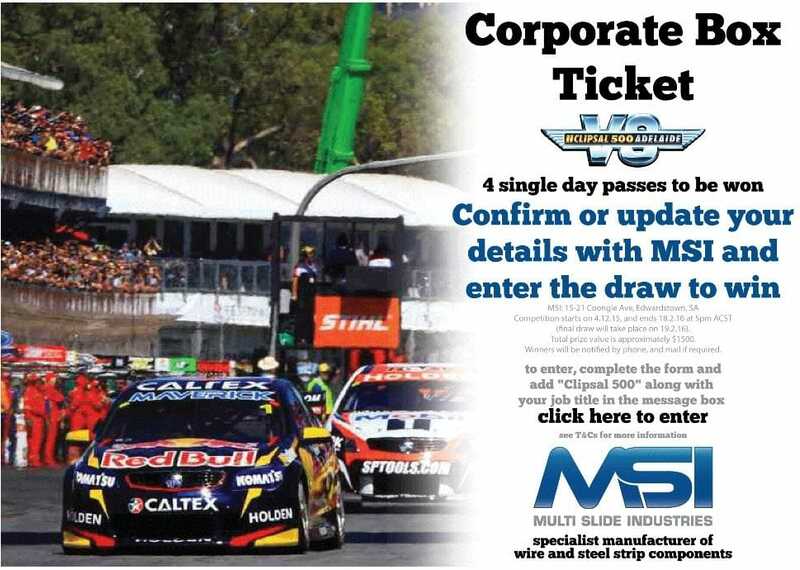 The rules of the competition and the prize for each winner are as follows: Complete all the fields on http://www.multislide.com.au/contact-us and also add "Clipsal 500" along with your job title in the message box, within the competition opening and closing dates. 8. Multi Slide Industries reserves the right to cancel or amend the competition and these terms and conditions without notice in the event of a catastrophe, war, civil or military disturbance, act of God or any actual or anticipated breach of any applicable law or regulation or any other event outside of their control. Any changes to the competition will be notified to entrants as soon as possible by Multi Slide Industries. 9. Multi Slide Industries is not responsible for inaccurate prize details supplied to any entrant by any third party connected with this competition. 10. No cash alternative to the prizes will be offered. The prizes are not transferable. Prizes are subject to availability and we reserve the right to substitute any prize with another of equivalent value without giving notice. Total prize value: approximately $1500. 11.The prize consists for 4 single day tickets to The Clipsal 500 event. d. 1 single day only tickets for Sunday the 6th of March 2016. Each single day only ticket will include entry to Multi Slide Industries' Trackside Villa, and includes food and drinks for the individual recipient only. 12. Winners will be chosen: At random from all entries received and verified by Multi Slide Industries and independent consultants. 13. The winner will be notified by phone call within 24 hours of the closing date. If the winner cannot be contacted, a letter will be mailed to their business address. Prizes unclaimed after 14 days from notification reserve the right to be withdrawn from the winner due to the time specific nature of each individual prize. 14. Multi Slide Industries will notify the winner when and where the prize can be collected. 15. Multi Slide Industries' decision in respect of all matters to do with the competition will be final and no correspondence will be entered into. 17. The competition and these terms and conditions will be governed by Australian law and any disputes will be subject to the exclusive jurisdiction of the courts of South Australia. 18. The winner agrees to the use of his/her name and image in any publicity material. Any personal data relating to the winner or any other entrants will be used solely in accordance with current Australian data protection legislation and will not be disclosed to a third party without the entrant's prior consent.